To carve or to paint, that's the question (right?). As charming as the traditional jack-o-lantern can be, we prefer to avoid wielding a sharp blade in the name of Halloween décor. Enter pumpkin painting--a safe alternative, which also yields longer lasting results. We are giving this arrangement away to one lucky winner (and yes, we will ship for free!). To enter, share this photo (either on Instagram, Facebook, Twitter, or Pinterest) and tag us (so we can put your name in the hat). We will draw and announce a winner next week! In addition to their culinary value, oysters are often incorporated into or are the subject of artwork. We support the "nose to tail" movement, which has swept through the American culinary scene. From the meat to the hide (or in this case, the shell), we believe the whole animal should be celebrated. Check out a few of our favorite local artists paying homage to the iridescent bivalve in a variety of ways. 1. What inspired you to incorporate oysters into your work? Probably what inspired me the most to start using oysters is the simplistic beauty of the oyster itself. Then the selection of each oyster became an art in itself from hand selecting them from the coast in Cocodrie, LA. 2. What's your favorite way to eat an oyster? Believe it or not, I do not eat oysters and yes, I'm from here. 3. What is the best thing about Autumn? My favorite thing about Autumn is the changing of seasons and cooler weather! Oysters have and will always be a part of New Orleans culture. The oyster is an important culinary element as well as an inspirational one. When opened, I find that the oyster presents a palette that is brilliant, timeless, and chic. My art reflects just this, and is to be comprehended with the spectrum of light -- how sunlight can change one's perspective instantly by bringing positive vibes to the onlooker, and creating a sense of serenity and stability. I like any dish with oysters incorporated, but I'd have to say my favorite way to eat them is raw. The weather in New Orleans gets so nice around that time after the hot and humid summer. Everyone is in a good mood; when you're surrounded by happy people, you're inspired to make great art! I've always been inspired by nature and coastal living. Oyster shells possess such a natural beauty that is often unrecognized. Through my paintings and décor, I focus on the organic shape and colors allowing them to be the main focus of each piece I create. Over the years, I have been blessed to share a little of Louisiana on a national and international level. Chargrilled, from Drago's or Mansur's on the Boulevard with a glass of champagne. Leather, the weather, and Halloween! Although the hallmark of our September tablescape is the gorgeous oyster shell garland, we are constantly on the look out for foliage to make every element pop. 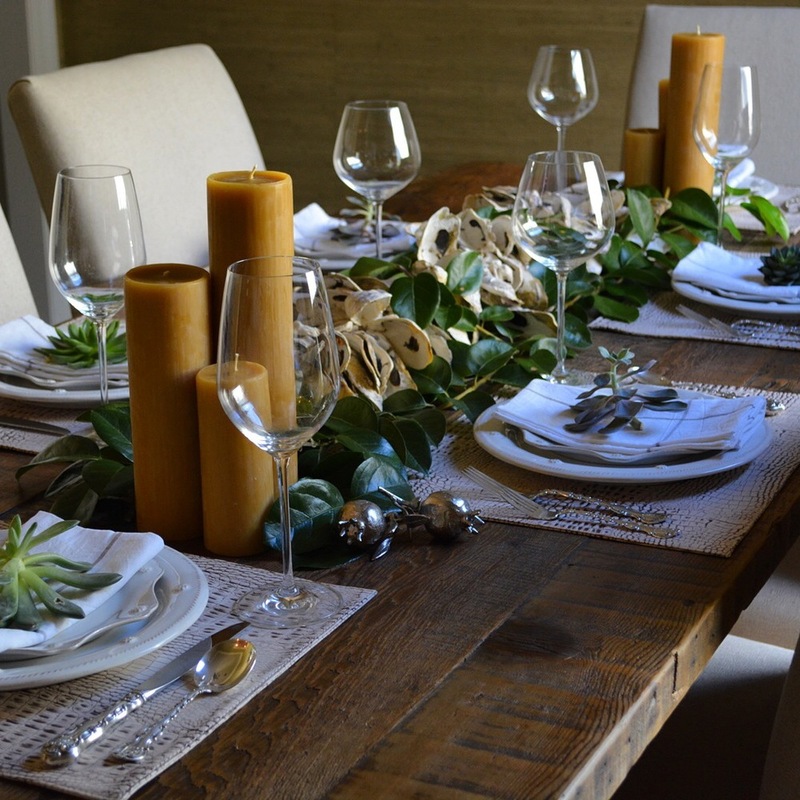 This month, we brought the outdoors in by incorporating fresh greenery and succulents straight from our garden. With every season, comes new ingredients. Each month, we will highlight a fresh ingredient, which is emblematic of that month, by providing recipes that incorporate it, tips on how to grow it, restaurant dishes that feature it, and other posts inspired by it.